Richard Irwin (Belper, United Kingdom) on 19 July 2008 in Plant & Nature. 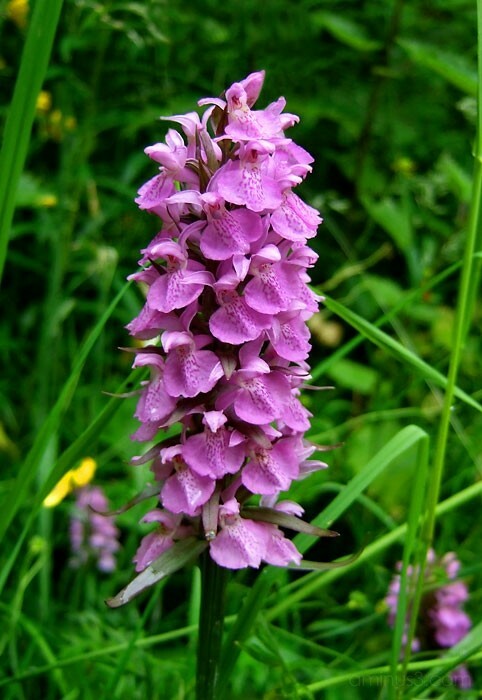 I found a patch of what I believe are Southern Marsh Orchids at the railway tunnel entrance at Monsal Head. I'm not an expert at distinguishing the difference between the rarer northern species and the more widespread southern versions of these orchids. Monsal Head lies at the boundary between the northern and southern ranges of these two species in Derbyshire. You have an excellent sense of proportion Richard! Well done! I wouldn't have expected that an orchid would grow wild in the U.K. Shows you what I know. The image as well as flower really pops out. I like it. For a wild flower it's quite beautiful. very nice shot , vivid colors . . .
Love the intensity here . . it makes for something special.